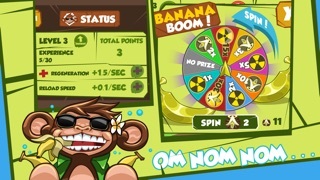 ★Going BANANAS has never been this FUN!★ A monkey style arcade game gone bananas. Strategy, precision & fast fingers is a must! 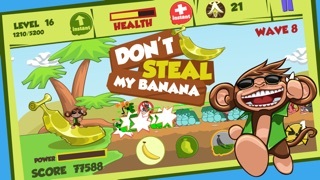 Amazing | 9 out of 10 "With an awesome soundtrack that feels like it was ripped right from the premium arcade games of my youth, Don’t Steal My Banana is a frenetic, addictive, and challenging iPhone game title. Sorry Donkey Kong, you’re no longer my favorite video game ape. That honor now belongs to baby monkey Ulu!" ~ Tapscape.com review Great | 4 out of 5 "I found the game quite interesting. The fast gameplay along with the funny pictures and the tapping and releasing control will let you enjoy the game for a long time. I highly recommend it!" ~ Shineapp.com review And this is what other gamers say about Don't Steal My Banana: Hilarious app ★★★★★ by Marlborof18 - Version 1.0 - Mar 31, 2013 This app is really funny and addictive to play. It is designed in a very simple way but full of exciting and enjoyable moments. I love it. I just can't stop playing it. Fun ★★★★★ by A77MiLos - Version 1.0 - Mar 31, 2013 Nice game, it's pretty fun to play. I particularly love its cute graphic design. The game seems simple at first glance, but actually it's much more competitive than I thought. It really requires high concentration and accuracy! Love it! Very addictive to play. 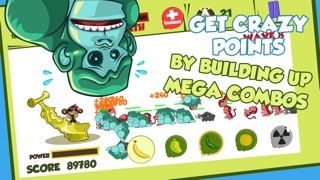 Awesome ★★★★★ by SS183 - Version 1.0 - Mar 30, 2013 Seems like a banana tower-defense game lol and I totally love it! The cute artwork design and its background effects is awesome, and the game strategy is simple but also competitive. It's incredibly fun and entertaining to play, nice to kill time on this boring weekend. Great ★★★★★ by cristian-01 - Version 1.0 - Mar 30, 2013 Great game!! I love arcade-games, but this is one of my favourites!! It works very fast and smooth on my iPad 2 iOs 6.1.2 My kids are playing it often, and they love it to! I'll give it 5 stars!! Great ★★★★★ by Deslee2012 - Version 1.0 - Mar 30, 2013 The gameplay is well polished. I like the monkey so much as it is cute and funny. Addicting game. Try it out for yourself and see how much fun it is! 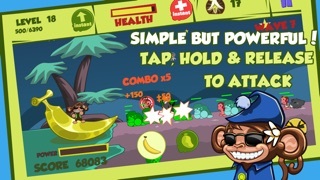 ------------------------------------ The Hero: You play as Ulu, a cute baby monkey living in the deep jungle of Bali. The Objective: PROTECT THE GOLDEN BANANA! The Background: It was an ordinary day in the jungle of Bali. Baby monkey Ulu was just laying around, doing his usual monkey business. Eating his bananas and chilling, when all a sudden a giant banana fell from the sky! And just like that Ulu is the proud owner of a golden, magical banana. As awesome as that may be, now he also has to worry about a bunch of angry jungle critters trying to steal it from him! But with your help baby monkey Ulu can do it. Help him protect his precious banana! 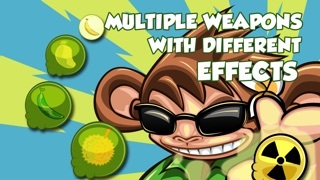 Use all the fruity weapons available to stop the critters: Bananas, Poison Bananas, Stun Mangos, Durian Grenades & even Nuclear Bananas ----------------------------------- Don't Steal My Banana features: ★ Simple, but powerful controls ★ Tap, hold & release to fire ★ Time your shots to build up massive combos ★ Amazing HD Retina Display ★ Master all the fruity weapons ★ Crazy power-ups & special weapons ★ Massive amount of achievements ★ Level up & become the ultimate baby monkey ★ Spin & win awesome prizes in the Banana Boom ★ Compete against your Game Center friends + much more BANANA-TASTIC action! ----------------------------------- Follow @BabyUlu on Twitter to keep up with our news! Get it now if you don't already! It's a great game but it freezes and goes back to the home screen just about every time I play it. The game is mildly amusing, but nothing new. I found the graphics to be very good. The game becomes repetitive very quickly; certainly not interesting enough to pay for additional upgrades. Perhaps the designer will enter into an agreement with a third-party such as TapJoy, to allow players to earn the upgrades without cash. Pretty cool game. Great graphics and packed with exciting features. The controls are easy to use. It also has a really good storyline. He loves it and it is helpful for focusing and eye hand coordination. Just wish there were more free stuff with it. Very fun to play though.